Maurits Cornelis Escher is a graphic known primarily for its lithographs and engravings. His work is aimed mainly at the psychological study of three-dimensional objects. He paid great attention to the concepts of distortion of space, infinity and symmetry. With the help of chiaroscuro created optical illusions. Maurits was the youngest of five sons, he was sick a lot as a child, and because of this he could not even get a certificate of maturity. From an early age the artist consciously studied as an engraver, and not as an oil painter. He was attracted by the possibility of creating a large number of prints as opposed to a single copy of the painting. Escher is the famous creator of the Penrose Stair effect illustration (picture Up and Down). For the first time I started painting fractals (in his version they were inspired by Moorish art and mosaics). Introduced the concept of “impossible figures.” In general, the mosaic in his work Maurits Cornelis paid great attention. Many of Escher’s works were subsequently repeatedly reproduced by other artists. Today, his work is studied not only as an artistic phenomenon, but also in the context of the theory of relativity and psychoanalysis. To understand the paintings of the artist requires some concentration and observation. On the “Reptiles” engraving, miniature crocodiles playfully crawl out of the mosaic pattern, become three-dimensional, begin a short cycle of life, passing a small circle, overcoming obstacles – to return to the plane again and turn into lifeless two-dimensional objects. One of the animals is a kind of fantastic derivative of the dragon, it releases steam from the nostrils. 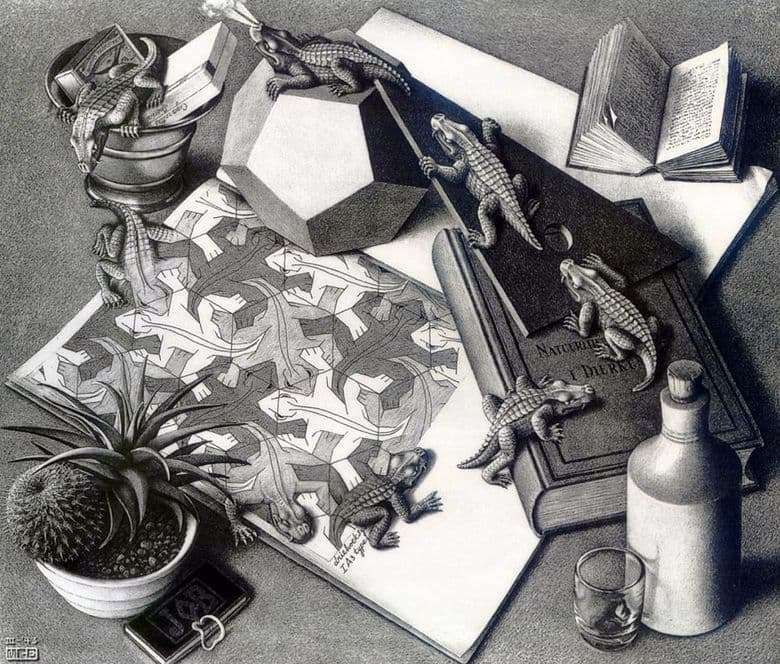 Escher’s world is amazing – depicted on a flat sheet of paper, the third dimension appears and disappears again in front of a surprised viewer. The shape of the reptiles – both lizards and crocodiles – fascinated the artist, he addressed her repeatedly, even used in mosaics. To date, there are many options for engravings “Reptiles” – bright, painted versions are popular with fans of the artist’s work.